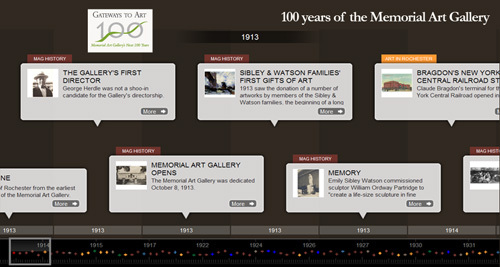 Celebrate the Gallery’s 100 years! We’re inviting the Rochester community to celebrate with us now, and into the next 100 years. Take a moment to look back at how far we have come —explore our interactive Timeline, including a Family History of Emily Sibley Watson. The Memorial Art Gallery’s centennial year was presented by Lynne Lovejoy, with additional support from Robert L. and Mary L. Sproull, ESL Charitable Foundation and Nocon & Associates, a private wealth advisory practice of Ameriprise Financial Services, Inc.